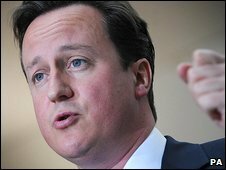 David Cameron has told council leaders they need to be more open about how they spend public money, urging a "new era of Google government". Councils should publish details of spending on items as small as £500 to inform the public and identify future savings, the Conservative leader said. Councils were efficient already, he said, but needed to deliver more for less in the new "age of austerity". In return, he said a Tory government would give councils more powers. "This new settlement between central government, local government and local people will be forged against a backdrop of austerity," he said in a speech to the Local Government Association's annual conference. "But rather than entering into this challenge by pretending there will be more money and an easy ride after the election, we will enter into it with an honest assessment of how things are." Mr Cameron said he had good and bad news for councils. If elected, the Tories would give them substantial additional powers but they couldn't expect more money and would have to do more for less. While they should make further savings, Mr Cameron said it was "idle and outdated" to assume that this must inevitably result in cutbacks in frontline services. Councils must think innovatively about how to save money, by working more closely with neighbouring authorities and forming partnerships with businesses. "Thirty years after Margaret Thatcher released a wave of initiative in the private sector, I want to see an equal surge of local entrepreneurialism in our public service." Greater transparency was key to this process, he added. By publishing details of their expenditure, councils would be able to demonstrate how efficient they were and, in some cases, encourage local suppliers to offer them better deals. "The best thing about transparency is that it does not need massive outlay of costs. "Along with you I want to bring in a new era of Google government." He insisted his pledge to decentralise power from central government and regional agencies to councils was not an empty one but that, in turn, councils must look to hand more power to local communities. He said he would scrap quangos like the Standards Board, give councils more housing and planning powers and allow them more freedom to raise and retain revenues. "In place of the old centrally controlled regime we will have councils empowered to exercise their own judgement. "This means that councils can do literally whatever the like as long as it is legal." The Conservatives are the largest party in local government, after winning a further seven councils and an extra 244 council seats in last month's elections.